The Hubble Space Telescope is a joint ESA/NASA project and was launched in 1990 by the Space Shuttle mission STS-31 into a low-Earth orbit 569 km above the ground. During its lifetime Hubble has become one of the most important science projects ever. Hubble's orbit above the Earth's distorting atmosphere allows astronomers to make the very high resolution observations that are essential to open new windows onto planets, stars and galaxies. 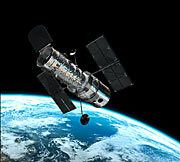 Hubble was designed as a high standard flagship mission and has paved the way for other space-based observatories. Notably it can access the otherwise invisible ultraviolet part of the spectrum, and also has access to areas of the infrared not visible from the ground. The Hubble Space Telescope is named after Edwin Powell Hubble (1889-1953) who was one of the great pioneers of modern astronomy. Design: At the heart of Hubble are a 2.4 m primary mirror and a collection of five science instruments that work across the entire optical spectrum — from infrared, through the visible, to ultraviolet light. Hubble is equipped with cameras, spectrographs and fine guidance sensors. The observatory was designed to be serviced in space, allowing outdated instruments to be replaced. The telescope was placed into a low-Earth orbit by the Space Shuttle and uses modular components so that it can be recovered on subsequent Shuttle Servicing missions and faulty or outdated parts more easily replaced before being re-released into orbit. Power: Power for the computers and scientific instruments onboard is provided by two 2.45 x 7.56 m solar panels. The power generated by the panels is also used to charge six nickel-hydrogen batteries that provide power to the spacecraft for about 25 minutes per orbit while Hubble flies through the Earth's shadow. Manoeuvring: The telescope uses an elaborate system of direction controls to improve its stability during observations. A set of reaction wheels manoeuvres the telescope into place and its position in space is monitored by gyroscopes. Fine Guidance Sensors (FGS) are used to lock onto guide stars to ensure the extremely high pointing accuracy needed to make very accurate observations. The telescope does not have any rockets on board. Boosting the spacecraft’s orbit can only be done during servicing missions, when the telescope is attached to the Space Shuttle. Dimensions: Length: 13.2 m, diameter: 4.2 m. In addition two solar panels each 2.45 x 7.56 m.
Mass: 11 110 kg (at the time of launch). Hubble was deployed by the Space Shuttle Discovery (STS-31) into a circular orbit approximately 570 km above the ground, inclined at 28.5 degrees to the Equator. The telescope whirls around Earth at 28,000 kilometres an hour and takes 96 minutes to complete one orbit. As of spring 2018, the telescope had made more than 163 500 trips around our planet. Those trips correspond to about 6.4 billion kilometres. As of spring 2018, the Hubble Space Telescope has made over 1.5 million observations of more than 43 500 celestial objects. The 28 years’ worth of observations has produced more than 153 terabytes of data and, the orbiting observatory generates more than 80 gigabytes of data each month. Astronomers using Hubble data have published more than 15 500 scientific papers, making it one of the most productive scientific instruments ever built. The science operations are co-ordinated and conducted by the Space Telescope Science Institute (STScI) in Baltimore and at NASA's Goddard Space Flight Center (GSFC) in Greenbelt. The European Space Agency maintains staff at STScI.